In previous posts, I have touted the joys of winter camping and all the fun family winter activities that can be enjoyed in an RV. Now, if you choose to take up winter camping and your travels will take you to areas with sub-freezing weather, there are several precautions you should be aware of. The number one concern is keeping your RV plumbing from freezing. Not just the freshwater system, but the waste holding tanks too. Winter camping is an enjoyable experience and there are easy ways to offset challenges. If you are new to sub-freezing camping, I suggest your first outing be at a campground that has electrical hookups. Having access to shore power provides plenty of energy to keep everything warm, the furnace running and removes the concern for keeping the batteries charged, which is a whole other entry. You will probably want to leave your RV winterized until you reach camp and take on water upon reaching the campground. Once you’re at your site, there are several things you will need to perform to protect your plumbing and keep things running smooth. Unless you have a heated freshwater hose, *fill your freshwater tank upon arriving, then drain and store the hose. Nothing takes the fun out of winter camping more than trying to coil a 25-foot water hose that is frozen stiff. (*Note: If your freshwater tank is not heated and you are concerned it might freeze over the course of your campout, leave enough room for expansion in the event the water freezes as to not split your water tank open). If you have an exterior shower, remove the shower head from the hose and make sure it is drained. While the hose and nylon faucet can typically withstand freezing, the shower head is the most susceptible to damage from freezing. If the back of your exterior shower opens up into an interior RV cabinet, like under the bathroom sink, leave the cabinet door open to protect the lines to the faucet and provide some heat to the back of the faucet itself. If you have electric hookups, consider taking an electric heater with you to save propane and furnace time. For safety, buy an electric heater (that shuts off if it tips over) or an oil-filled electric heater. I carry an oil-filled heater as there is no fan to make noise to keep me awake at night. Know where your freshwater pipes are located. If they are located in the back of your cabinets, leave the cabinet doors cracked so heat can circulate to them. If they are located in the floor along the heating ducts, make sure your furnace cycles occasionally to prevent them from freezing. Keep your holding tanks and valves from freezing by adding RV antifreeze to the tanks. The amount you will need to add will be proportional to the contents in each tank. Also, if your travels to and from the campground will be through winter conditions, be aware that ice can build up on your dump valves and termination cap (see below photo), which makes for an interesting proposition when you go to dump your tanks. Subfreezing camping and the precautions and trials that come with it is just another adventure in RVing. Get out there and enjoy! This new luxury Diesel Floorplan on a 291″ Tag Axle boasts many features found in the more expensive Winnebago Grand Tour 45RL. Spacious living space, the Glide & Dine Table and Chairs, a retractable fireplace, 1 1/2 Baths (including double sinks in the master bath), and 210 cubic feet of exterior basement storage, are just some of the many reasons you’ll want to see the new Winnebago Tour/Ellipse 45RD. This new Diesel Floorplan, with a 400-hp Cummins ISL 8.9L turbo-charged diesel engine on the Maxum Chassis, includes: 1 1/2 baths, a front entertaining area with large windows facing the patio side, cab seats that rotate to become a part of the living space, a great deal of bedroom storage, and an amazing 229 cubic feet of exterior basement storage. 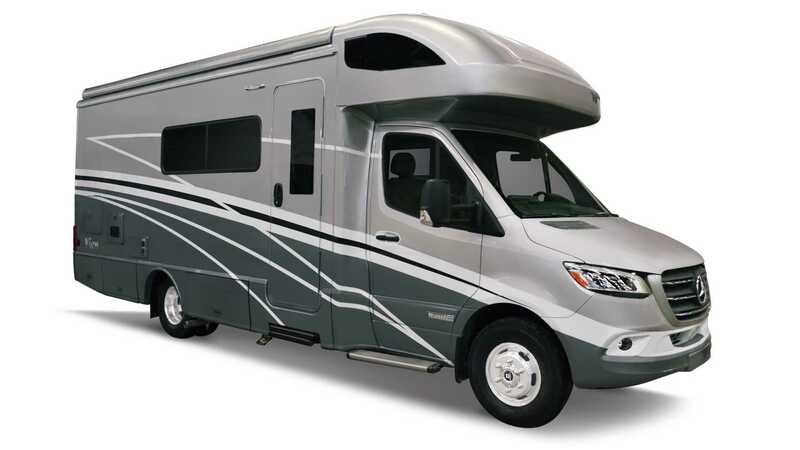 This class A gas motor home packs a lot of amenities in a shorter floorplan length. It features a double slideout, a king sized bed, an all-in-one oversized bathroom, a large amount of interior storage, an expansive patio awning and it sleeps up to 8 people with the optional powered StudioLoft Bed. 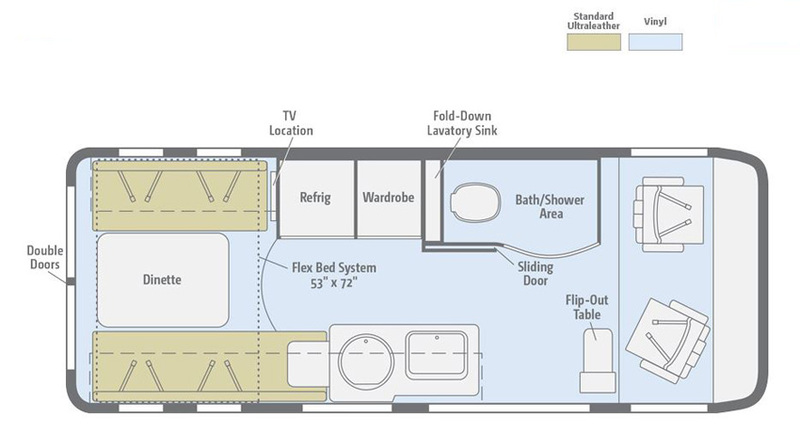 This new class A gas motor home floorplan on the Ford F53 Chassis features: double slideouts including a large sofa/dinette slideout, a king sized bed, a large wardrobe in the bedroom, cab chairs that rotate to become an important part of the living space, 124 cubic feet of basement storage and sleeps up to 8 with the optional StudioLoft bed. 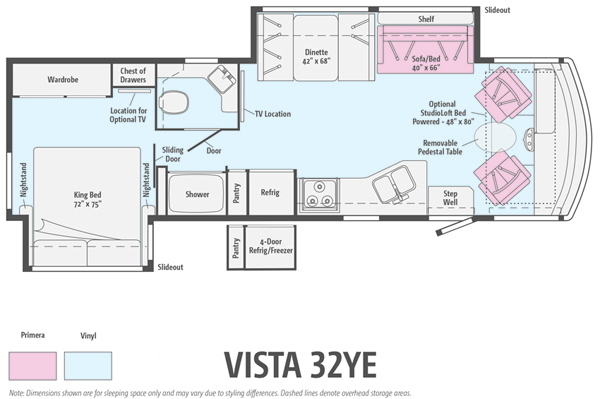 This floorplan has contemporary styling rounding out this new 32YE floorplan. The Winnebago Paseo, Winnebago Industrie’s newest Class B Touring Coach, is on the Ford Transit Van Chassis and boasts the power and fuel economy of the Ford EcoBoost gas engine. It includes a 5,000 lb factory installed towing package and an oversized bath-in-one shower area. It includes the Ford SYNC 3 voice activated stereo/navigation system. The rear third of the coach is completely transformable to your needs with the help of a specially-designed Flex Bed System that offers multiple sleeping and daytime configurations. 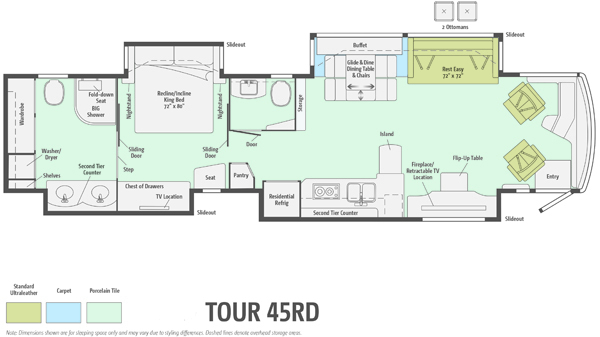 See the floorplan below or CLICK HERE for additional information. 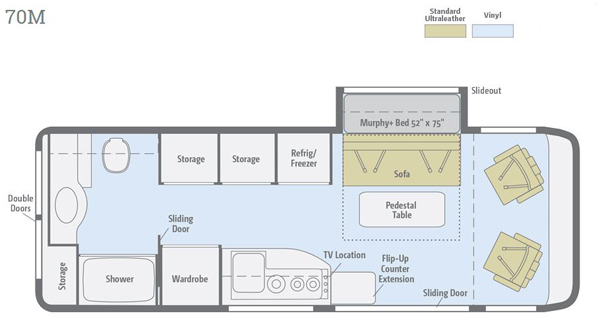 The Era 70M, the newest edition to the Winnebago Era floorplans, provides an expansive rear bathroom and a sofa/murphy bed slideout. It has a whopping 44 gallon freshwater tank capacity and 22/25 gallon black/grey tank capacity allowing longer periods of time before you need to get freshwater or visit a dump station. This 70M is built on the Mercedes-Benz Sprinter Chassis and has a 3.0L 6-cylinder diesel engine. 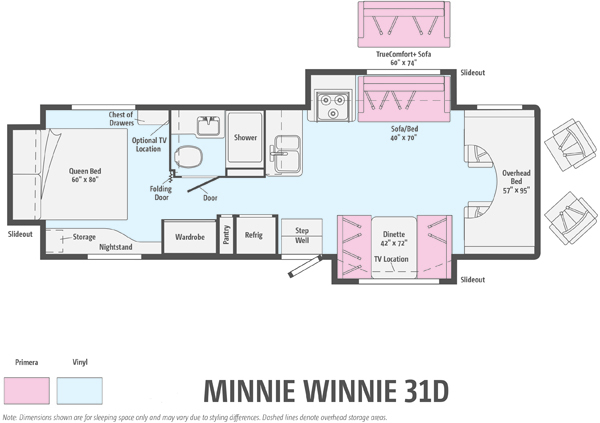 This all new Winnebago Minnie Winnie/Sprit floorplan features triple slideouts including opposing front slides which maximize this living area. It has an amazing 93 cubic feet of basement storage and large holding tank capacities. The Sofa Bed converts into a full sized queen bed and the master bed remains fully intact when rear slide is brought in. 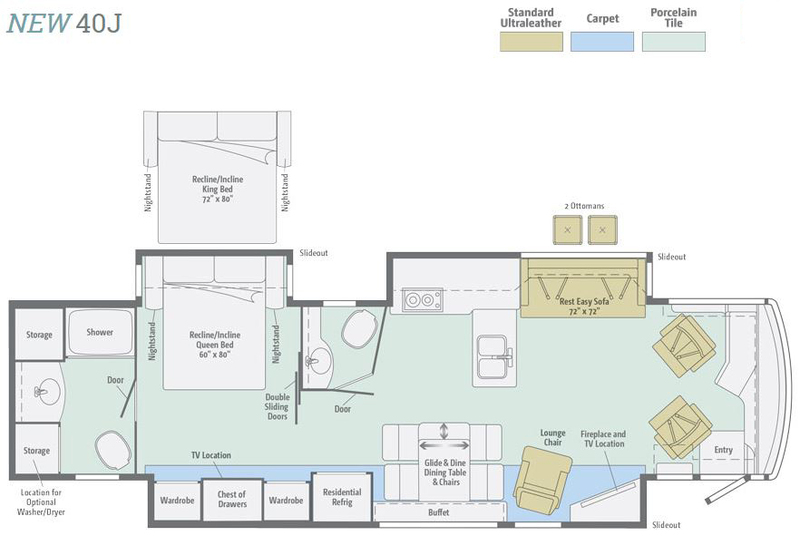 The Premium Package can be added to this floorplan adding additional conveniences to this RV. 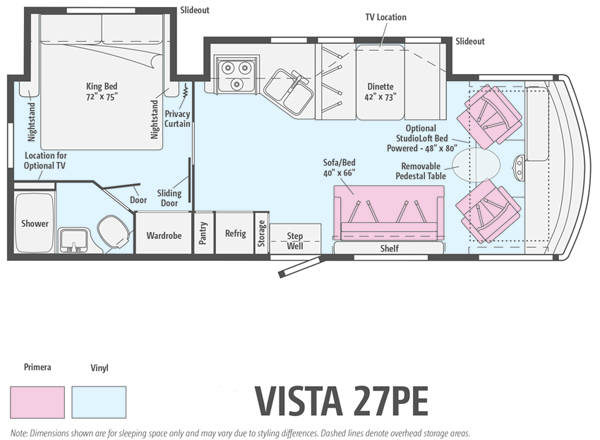 In case you missed it, CLICK HERE to watch a video actually taken at the RVIA National Trade Show featuring a number of these new floorplans. To find out additional information about these newly introduced foorplans, contact Lichtsinn RV today at 1-800-343-6255! Dinghy towing or towing your vehicle behind your motorcoach with all four wheels on the ground is by far the safest and most convenient way to bring your passenger car, truck or SUV along for the trip. Although no manufacturer has yet to engineer a plug-and-play setup directly from the factory, it’s never been simpler to equip both dinghy and your motorhome for road usage. Ron Lichtsinn and Brian Buffington, Lichtsinn RV Service Director, take us through how to hook up your tow vehicle in this VIDEO. At Lichtsinn RV we offer complete installations of dinghy setups, from Blue Ox to Roadmaster. Setup takes about a full day and we offer package pricing on complete setups. Leave it to the experts on this task to keep you secure down the road! Call us today to schedule your tow bar installation at 1-800-343-6255 or to schedule it on-line CLICK HERE. Forest City, Iowa – Lichtsinn RV of Forest City is excited to announce a number of staff promotions and additions at the dealership. These changes have been made to align with the continued growth of the Winnebago RV Dealership. Hannah Lunning has been promoted from the position of Business Manager to the position of Sales Manager. 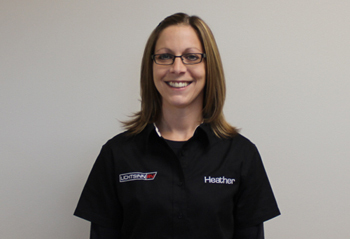 In her new position, Hannah will oversee the Lichtsinn RV Sales Team. Casey Singelstad has been promoted to the position of Controller and Human Resources Manager. Casey will oversee all administrative, accounting and human resource functions. Brandon Mondt has joined the Lichtsinn RV team as a Business Manager where he will responsible for working with guests on RV paperwork and providing them RV Protection Products. Before joining the Lichtsinn RV team, Brandon was an Insurance Provider for MBT Bank in Lake Mills, IA. “I look forward to working in a fast-paced environment with a great group of people, as well as helping guests fulfil their dreams of owning an RV” Mondt said. In Mondt’s free time, he enjoys spending time with his family, playing golf and being outdoors. Forest City, Iowa November 9, 2016– Lichtsinn RV is excited to welcome Abby Duregger and Heather Garza to their team in Forest City, Iowa. Duregger is a Garner-Hayfield graduate and attended the University of Northern Iowa in Cedar Falls, IA. Duregger’s position is Administrative Assistant. She is often the first voice, and the first person guests meet upon calling or entering the dealership. 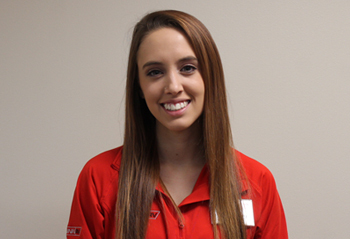 Before joining the Lichtsinn RV team, Abby was a Merchandising Operations Leader at Petco. “I look forward to getting interact with guests from all over the United States” Duregger said. In Duregger’s free time, she enjoys spending time with family & friends and spending time outdoors. Garza is a WCLT graduate and attended Hawkeye Community College in Waterloo, IA. Garza’s position is RV Finishing & Quality Control Lead, where she helps to oversee the finishing process for all dealership vehicles. Before joining the Lichtsinn RV team, Garza was a 3M Film Applicator at CDI. “I look forward to the flexibility in the mornings with my kids and look forward to working within a team oriented atmosphere” Garza said. In Garza’s free time she enjoys spending time with her family, camping and fishing. Lichtsinn RV in Forest City, Iowa, is the #1 dealer of Winnebago motor homes in all of North America for a single point location dealership. 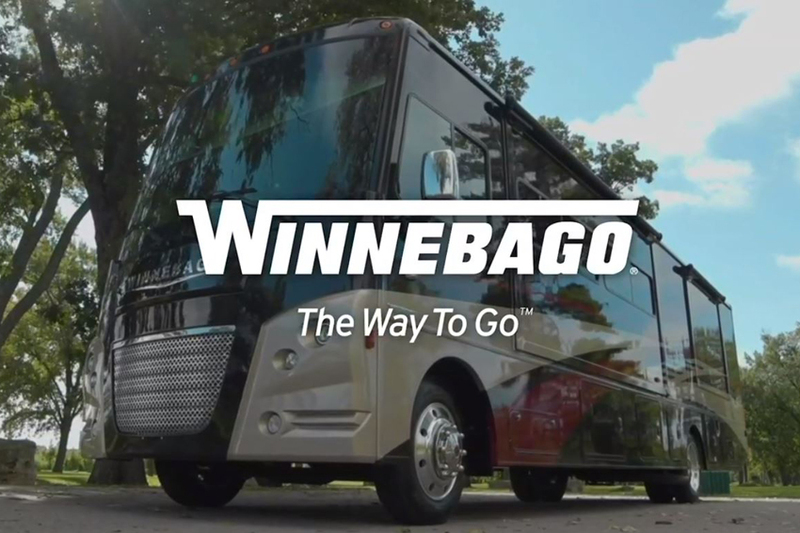 In business for over 40 years, they offer factory fresh Winnebago, Itasca and Winnebago Touring Coach motor homes and are only one mile down the road from the Winnebago and Itasca factory. They also feature pre-owned motor homes, travel trailers and RV rentals. Lichtsinn RV offers quick service that is done right the first time and is home to the fastest, most knowledgeable parts team in the U.S.
We’re excited to announce that we now offer Seal Tech, a service we provide that helps seal leaks your RV may have. Have a leak, but can’t locate it? No problem, we’re here to help find it and take care of it. Below is a short video of the Seal Tech process. The Class B market continues to grow, in large part due to the success of the Era®. 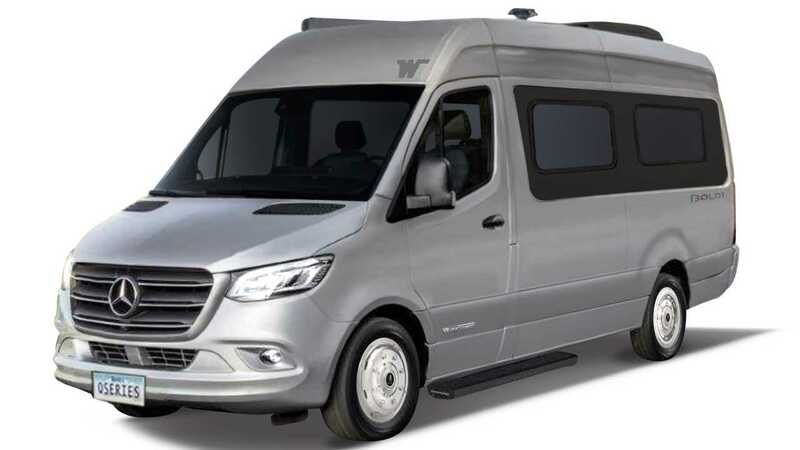 Its combination of fuel efficiency, maneuverability, and high-end features has introduced a whole new set of enthusiasts to the van-style RV. With its Mercedes-Benz® diesel engine, driving your Era is a pure joy. Arrive at your destination safely and on time with the help of the Radio/Rearview Monitor with 6″ touchscreen and the available Rand McNally RV GPS. Each floorplan offers a full-featured galley and swivel cab seats that increase your functional living space while parked. Inside, you’ll find dimmable LED ceiling lights (70A, 70X), MCD blackout roller shades, Corian® countertops, and a rear screen wall (70A, 70X). An awning with LED lighting will keep the outdoor fun going well into the night. 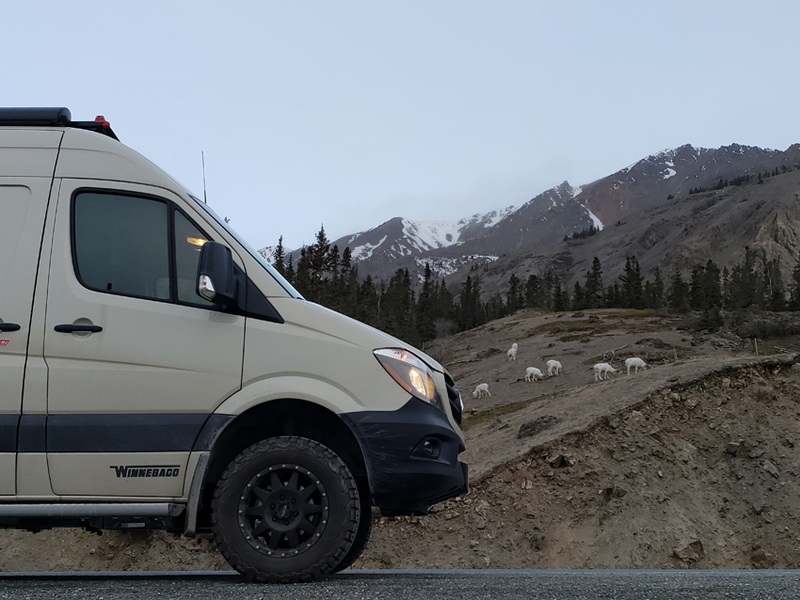 Take your travels off the trails with the all-new Era 4×4; the first Sprinter-based off-road RV from Winnebago. Enjoy all of the same amenities, 5,000-lb. towing capacity, and two additional inches of ground clearance. For versatility and style with Winnebago’s legendary construction standards, choose the Era. Arrive at your destination safely and on time with the help of the Rand McNally RV GPS. The Era offers a full featured galley and swivel cab seats that increase your functional living space while parked. Inside, you’ll find dimmable LED ceiling lights, MCD blackout roller shades, Corian countertops, and a rear screen wall. An awning with LED lighting will keep the outdoor fun going well into the night. For versatility and style with Winnebago’s legendary construction standards, choose the Era. Costing thousands less than Roadtrek and Leisure Travel Vans, the Winnebago Touring Coach Era never ceases to amaze. 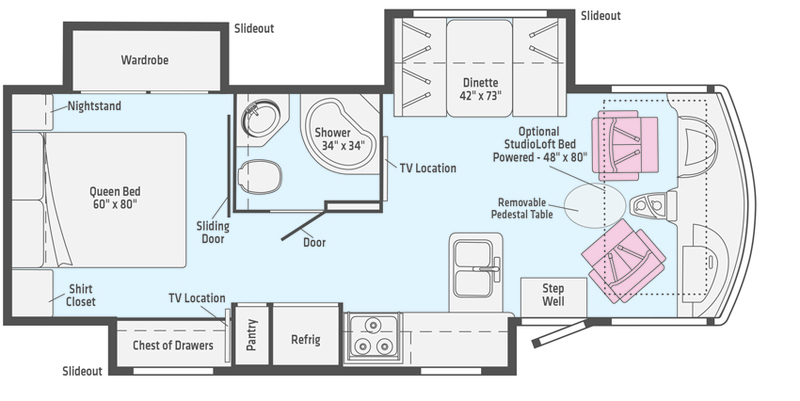 The 70C floorplan features a slideout, permanent dry bath, a fold and tumble FlexSteel bed, and Alde hydronic heating system for even more indoor enjoyment. Click Here to see the Winnebago Eras we have in stock today or call the dealership to speak with one of our factory trained Winnebago Sales Consultants – 1-800-343-6255. Closeout Sale Pricing on All Remaining New 2016 Models In-Stock! With the end of the year approaching, we have introduced CLOSEOUT pricing on all remaining New 2016 Motor Homes! We have both Class A Gas and Diesel models available at Closeout Pricing. Shop with us now before these remaining units are sold! Click Here to see the remaining 2016 Closeout RV’s or call the dealership to speak with one of our factory trained Winnebago Sales Consultants – 1-800-343-6255.